My son just turned 18 (I can’t believe it, I just can’t believe it!). One of the things we did to kick off his birthday weekend was to open the time capsule that I created for him the year that he was born. I can not tell you how much fun this was for all of us! He really got a kick out of how much time had changed in 18 years and I really loved the walk down memory lane. This project was so much fun that I think that anyone who is pregnant now or just had a baby should really do this for your future adult child. 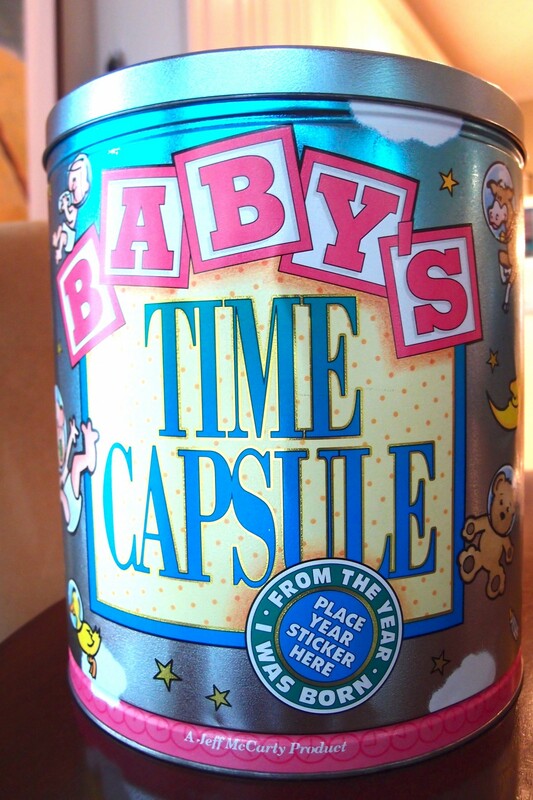 It would make an awesome baby shower gift or activity – each guest can bring something to add to the time capsule. 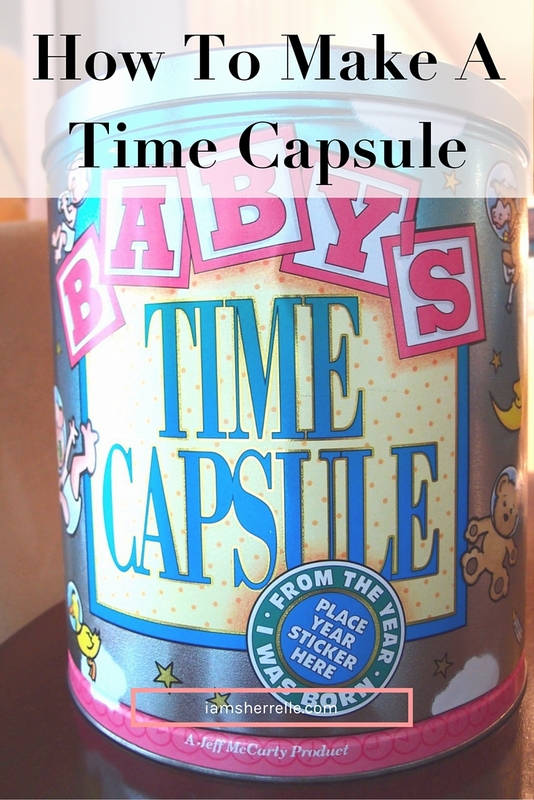 I bought this time capsule kit over 18 years ago and I’m not sure if this company is still in business, but this is a similar product and the one that I have put away for my daughter. You can also just buy a can with a lid at The Container Store. My kit came with a booklet that the parents filled out about current prices of houses, cars, food, etc and our predictions about what those prices would be in the future. We also gave a snap shot of our life back then: where we worked, where we lived, how we spent our time. The most fun read was our predictions about future inventions and technological advancements: we were wrong about the flying cars, but right about most other things like “Pocket-size cellular telephones will become a staple item for all Americans – youth and adult” and “We will be able to buy almost everything on the computer.” That seems like a “well yeah, duh” moment now, but remember, this was in 1995! If you make your own time capsule without a kit, you can write all this information in a notebook. People magazine’s year end issue – I bought this at the end of his birth year. Entertainment Weekly magazine – bought at the end of the year. Life magazine year end issue – these are so great to look at now! Both of these men were headliners in 1995. This is a Best Buy newspaper insert. Look at how ancient – and expensive – these computers were! My husband went to the Million Man March: this is the program, a bumper sticker and a photo that he took while there. The Tick and X-Men were my favorite comic characters in 1995. These issues are in mint condition. I want to read them, but my son won’t let me take them out of the wrapper. I love, love, LOVE that I put these toys in the time capsule! As the first computer generated movie, Toy Story was a big deal. Even better is the fact that my son became obsessed with this movie at age 2 when it was released on VHS and that the Toy Story movie franchise is still going strong today! I did make one mistake: since I didn’t put a sticker date on the outside like I was supposed to, we opened the time capsule 7 years too early. According to my original plan, he was supposed to open it at age 25, but I had forgotten and it wasn’t marked. Oops! Hey, who knows – in 7 more years cars could possibly fly and I would have been correct in all my predictions! Actually I think that age 25 is too long to wait to open the time capsule, but I wouldn’t do it before age 16 – between ages 18 and 21 are probably the best. I hope that I have inspired you to create this wonderful keepsake. It doesn’t take much effort, but it is so special and fun to share together many years later.